Posted on December 12, 2017 by Jeanne Mahony wrote in Uncategorized. Hope Beer drinkers will remember Limited Edition #4 Export Stout from the end of 2016. It was so delicious it was generously used in Mrs. Nixon’s Christmas puddings! We are now delighted to announce that this year’s dark winter offering is a craft beer winner – Limited Edition No. 8 Imperial Oatmeal Stout. It comes in at 9.5% ABV and is brewed in collaboration with DOT Brew, the Dublin 8 based specialist gypsy brewery. So, what is an Imperial Stout, we hear you ask? As you know, stout is the national beer of Ireland but the variety produced by Guinness is a “dry stout”. This is less sweet than the stouts traditionally produced in the UK and is generally acknowledged as the standard stout style. An imperial Stout, on the other hand, was originally brewed for export from the UK to Eastern Europe, specifically the court of Catherine II of Russia. This is because it had to travel long distances, therefore it needed a higher alcohol content to preserve the beer for longer. Imperial stout is therefore also known as Russian Imperial Stout, and is sweeter in style and typically has an ABV above 9%. 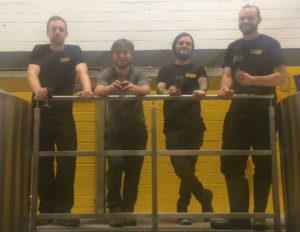 Our latest offering started out in earnest in October when the Hope Beer team together with Shane Kelly of Dot Brew starting to discuss the kind of stout they wanted to create. They then set themselves the arduous task of tasting as many as 14 different stouts (in one sitting!) in an effort to hone the new recipe. The result is a full bodied, rich stout with an elegant velvety mouthfeel, coffee and chocolate aromas, malty caramel & biscuit backbone…. a decadent nod at the national drink. We have now released half the batch as Hope Limited Edition No. 8 and DOT Brew will be releasing the other half in 2018 after it has been aged in bourbon and rum barrels. You can find it in most independent Off-licences. Click here to find out where to buy our Oatmeal Stout. Enjoy! Win a gift pack of Hope Beer and a brewery tour!